Tonight at 7.30pm, Emma will take part in a special evening at St. John's, Smith Square, London SW1. 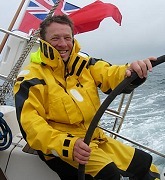 Roy Goodman, ex-star treble, violinist, conductor and yachtsman extraordinary, is marking his 60th birthday (and doubtless further decades of non-retirement!) with a programme about the natural world and his favourite element, "to celebrate the Sea, the passing of time and longevity!" Emma has had wonderful experiences with Roy and his Brandenburg Orchestra in the past; this time she will sing "Ino," a big and colourful piece written by the sprightly Georg Philip Telemann in his eighties. Ino was Semele's sister, who rescued the infant Dionysus after Semele's immolation, but herself had to flee her maddened husband Athamas. Clutching her last surviving child she leaps in desperation into the sea, where miraculously she is saved by the gods and becomes an immortal water nymph. The cantata begins with dramatic recitatives and desperate arias, then come charming dances for flutes, horns and strings, and an ecstatic finale. After all this Emma will be very glad to sit and listen to Haydn symphonies, no 6, 7 and 8  entitled Le Matin, Le Midi and Le Soir. The orchestra has a special guest leader in Elizabeth Wallfisch. It promises to be a very rich and joyful event.